One of the more unusual projects we were asked to bid on involved the integration of digital thermometers with Pocket PCs. The requirement was for restaurant inspectors to be able to make surprise inspections and insert the thermometers into meat that was being cooked in the kitchen to ensure it was cooked to the right temperatures. They wanted the digital thermometers to record the temperatures and for our inspection software to grab the thermometer readings and automatically add it to the inspection forms on PDAs. Once the inspection was completed, the inspectors wanted the information to be synchronized to a central database via wireless synchronization. I wonder if the medical field would like this feature? An additional requirement was for service technicians installing and maintaining equipment in these restaurants to be able to take "before and after" digital photographs to document their work. I know Plastic Surgeons would like this feature. This was important because the restaurant owners did not live in the same region as these restaurants and wanted to view the completed work before paying for it. A few months back one of my sales reps came into my office to brag about a new customer. Seems they had sold our Intercue Mobility Suite to the US Airforce. I get excited about sales to large organizations so wanted to learn the details. I could image all kinds of mission critical applications involving the war on global terrorism. I could see the press releases, articles, news interviews and a visit with Oprah on the horizon, but alas it was not to be. Our application was mission critical only to the groundskeepers on the US Airforce base in Germany. Seems they needed to inspect hedges, lawns, sprinkler systems, third party landscape contractors, flower beds and the removal of grass clippings. OK, not as exciting as I had hoped, but valuable none the less. Their current method of tracking the quality and work to be done on the landscape of this very large military base was to document everything on paper forms. This data would then be entered into a database application in the office to manage the work and dispatch landscape maintenance crews. By automating this process using electronic forms on PDAs that synchronized with their database application, they were able to make this process much more efficient. Oprah will have to wait. I have spent a lot of time with government agencies this month reviewing how they monitor and inspect an organizations' compliance to various laws and regulations. For example, today we delivered a solution to a government agency called the Board of Pharmacy. They will be monitoring and inspecting facilities to ensure they are handling and storing medical drugs in compliance with the laws and regulations of their state. Last month we supplied PDA based inspection forms to the City of Amsterdam in Holland. They are inspecting and monitoring compliance with environmental laws and regulations. We are now starting our 3rd mobility software project with the Idaho Transportation Department. 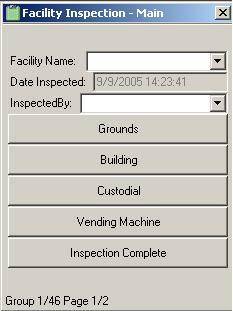 They inspect their facilities and the work third party contractors do for them. This data is synchronized to a central database from all across the state. Our latest project involves enabling mobile printing from their Pocket PCs in the field. Agency: Is there a way we can fill out an inspection form on a PDA that can then be synchronized with our office databases without needing to re-type the data again once we return to the office? Agency: Can I look up, on my PDA, my past inspections at this location to see if they were non-compliant with any items on previous inspections? Agency: Can I reference the definitions of various terms on my inspection form to better understand how to grade or rate a particular item? Agency: Can I make a "smart inspection form" that will route me to a different sets of questions based upon the data I enter on my inspection form? Agency: Can I print the results of my inspection and leave a copy at the premises? Kevin: Yes, if you have bluetooth enable PDAs and bluetooth enabled printers. You can print on 2", 3" 4" or regular A4 or 8 1/2" x 11" paper. Agency: Once I have your software for quickly creating inspection forms that synchronize with my enterprise database, can I edit my own inspection forms? Kevin: Yes, we provide you with the software development kit for creating and editing inspection forms. Agency: Is a PDA based inspection solution expensive? Agency: Does your company know you are blogging and other people can read this? This morning I read about a new PDA phone with integrated GPS and TMC (traffic management channel). This article tickled my imagination. When these kind of handheld devices are easily available, it will become natural for mobile workforces to have software on the PDA that will report their location to a central dispatch management system, where dispatchers can help route field service technicians to the closest next job. This will improve the response times, lower fuel costs, make customers happier and improve profits for the service company. Once you have integrated GPS with your "work order management system" you can add GIS and geospatial data collection to your application. Basically what this means is you can associate your work, orders, deliveries, inspections, etc. to a GPS coordinant. Once again this will help management understand patterns, costs, best routing methodologies, locations to build new facilities, and much more. It has been our strategy since 2000 to develop “software development kits” for mobile environments. Because of the power and flexibility of the "software development kit" approach, we can easily develop and implement cost effective projects with the above described unusual requirements. What Part of Your Application Do You Mobilize? How does your mobile workforce capture data today? Do they use paper forms and a clipboard? Where is the primary ROI (return on investment) coming from? Is it eliminating data entry at the office? Is it extending business processes to the mobile workforce? Is it getting complete and valid data from the field? Is it the ability to query enterprise information from the field? Is it visibility to real-time data (inventory, shipping, project status, etc.)? Do you need your entire enterprise database application in the hands of your mobile workforce, or only a subset? Do you require a full laptop or Tablet PC, or can you accomplish your goals with handheld PDAs? The answers to these questions helped us understand what to mobilize first. Handheld PDAs do not yet have the same level of data storage and memory that are available on enterprise database servers. Therefore, you need to determine what subset of data and software functionality you need on the handheld PDA to get your desired ROI. If the primary reason for mobilizing your "service orders" is to eliminate the need to re-type all of the information once you return to the office, then electronic forms with database synchronization is enough. If you want your mobile PDA application to be pre-populated with data from your enterprise database, then this is another level of sophistication. If you want your PDA application to take advantage of handheld computer components like GPS, digital cameras, Bar code scanners, GPRS data cards, etc., then you can add this layer. If you want lots of validations and business logic on the handheld this is another consideration. The bottom-line, find your primary source of ROI, and start there with version 1 of your mobile application. You can then prove to yourself the value of mobilizing your business processes and then confidently build from there. MobileDataforce was founded as the result of several mobility projects on Palm OS devices in year 2000. We started as the IT department for a company providing community based assisted living care to mentally disabled adults. The Department of Health and Welfare support the care of many of these individuals and all of the services must be completely documented and regularly audited. The volume of paper forms that are required and the challenges with managing care state wide motivated our founders to seek ways to use electronic forms on PDAs to capture data and synchronize it with a central database. The first step was to convert paper forms into electronic forms that could be used on PDAs. After successfully creating a few of these electronic forms with a lot of time and effort, we realized it would be more efficient to create a software development tool set to speed it up. This development tool set became Intercue Mobility Suite. Our founders used Intercue Mobility Suite to automate their Quality Assurance forms, Timesheets, Initial Assessment forms, and many other paper processes. 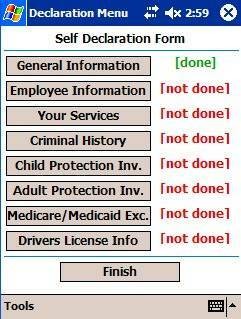 These forms can now be filled out on PDAs around the state and synchronized with a central database. We started with Palm OS support only in 2000, but quickly added Pocket PC, Tablet PC, Windows XP and now Win CE.Net. The Intercue Mobility Suite was first available to the public as a product in 2003. It is now used around the world for remote data collection and database synchronization. In 2005 a database centric software development environment was released by MobileDataforce called PointSync. Synchronize using your GPRS mobile phone network with your PDA Phone, or ruggedized handheld computer using a data card. Synchronize using a traditional dial-up connection on your phone. You can get modem cards for your PDA or ruggedized handheld computer. Wait and synchronize when you return to the office or your home computer with internet connection. Synchronize using WiFi, this is not common in Remote-Mountains, Idaho, but Boise and beyond all have this. The bottom line is that you can synchronize to a central database from any place where you have access to an internet connection. Incomplete work orders that require the data entry person to track down the field service technician for additional information. Many of these inefficiencies involve the field service technician calling the office, and using the office staff as an intermediary to gather information. This process turns a 1 person task into a 2 or 3 person task. Automating the "work order" process can save a great deal of time and money. Integrate GPS with the work order management application so the office has visibility to the location of the field service technician. Check inventory levels via the PDA with a wireless connection to the office inventory software. New technologies in 2006 will also enable the field service technician to talk through their handheld PDAs directly with the dispatch center. Many handheld computer manufacturers are adding this VoIP technology now. It is very easy to demonstrate a positive ROI with Mobile Work Orders. We have an ROI calculator on the bottom of our website that you can use to determine your specific ROI. In the last few months my team has been involved in a number of different Waste Management projects using Pocket PC computers. I would not have predicted this industry as a niche market for mobile solutions. Let me briefly outline the problem and solution. The European Community has passed a series of laws regulating the handling and disposal of waste and recyclable materials. I also read in the newspaper last week that the state of Maine has recently passed similar laws. Waste producers must have an audit trail or documented "chain of custody" of their waste from origin to disposal. They must maintain records of the amount, and type of waste, when it was picked up by a trucking company and delivered to a collection facility, and ultimately delivered to the final disposal company. This audit trail involves a lot of paper and must be available for access by government agencies that audit this process. The waste collecting trucking companies need to collect data at the site of the waste pick-up, and they have been seeking a good solution to this paper headache. The solution involves handheld PDAs using MobileDataforce's PointSync that are integrated to a Waste Management applications in the office. This Waste Management application is often web enabled to allow the waste producer to view their "pick-up reports" for auditing purposes in near real-time. The value of this applications goes beyond just data collection efficiencies provided to the waste collecting trucking companies. The value is in keeping an electronic chain of custody record that is accessible to all participants in near real time. The unique part of this software application developed in PointSync is the "planogram". This PointSync micro-application predicts how much product the specific store usually requires between deliveries. For example - store 104 averages 6 boxes of widgets number 97 between deliveries. 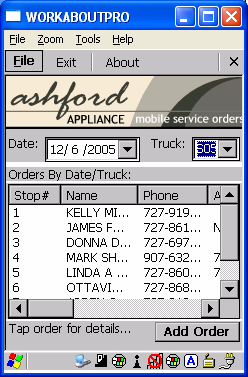 The delivery driver/sales person does not have to determine the appropriate number, the application predicts it based upon historic data in the database on the handheld computer. This kind of application is interesting because rather than simply displaying data, it uses this data to "think" on behalf of the user and to provide instructions to the user. This is true business process automation at work on a PDA. Conrad, a software developer and web guy on our team, has created our first PDA formatted website. This website will allow PDA and handheld computer users with WiFi or mobile phone connections to view information on our software solutions, download applications, view screen shots of applications in our library and much more - all formatted for PDA screens. This new website is small now, but we have ambitious plans that will keep it growing into an import resource for companies researching our mobile software solutions. This last week I had the opportunity to meet with 2 different state government agencies here in the USA. We discussed many different business processes that lended themselves to mobilization, but one stood out for its uniqueness. In Idaho people farm elk, not all people, some farm potatoes. These elk farmers need to protect their herds against disease, and document the fact that their herds are disease free. These farmers must register the locations of their herds using GPS coordinates, and then collect geospatial data concerning the details of the herd, their immunizations, history, etc. This is becoming increasingly important, since if one herd has a disease, it could impact the sales of all meat in that region. Farmers must not only protect their animals, but effectively market and promote the health status of their herd in order to continue selling during times of disease. It is not enough to document the location and health of your herd, one must document the location and health of each individual animal. RFID ear tags are often a good solution to this. In my discussions last week concerning the elk farmers, these farmers created collection zones where all animals walk through a specific location, whether a water trough, feedlot, or salt lick. These locations funnel the animals through narrow paths where RFID readers can collect and inventory the details of the herds and individual animals. This information allows these large animals to be effectively managed and documented without trauma and risk of injuring the animals through large round-ups and corral lock-ups. Elk are strong, wild and flighty and it is dangerous to handle them. Therefore, the less you need to confine and handle them, the better. PDAs are used through-out this process to document information on herds, pastures, health, births, injuries, deaths, GPS coordinates and much more. MobileDataforce's PointSync solution can effectively be used to develop and customize these mobile applications. Recently our team has been working on numerous projects and proposals in the automotive industry sector. I am impressed by the broad range of applications that are being brought to our attention. Work Orders, Part 2 - third party mobile auto body shops are using PDAs to track windshield repair, dent removal, spot painting, and headlight repair on used cars. The PDA based work orders are used to document work and to invoice for the work. Location based applications - PDAs with RFID readers are being used to identify the location of a specific car in a large lot. Some of these are using a triangulation of long range RFID signals. Industrial trucks - RFID applications are being used to track all portable equipment in the back of service trucks. Items such as ladders, generators, tools, etc. are each given an RFID tag. If the service truck drives away from the tools, the RFID signals will be lost and a warning is sent to the driver's PDA that identifies the tools left behind. This requires an RFID reader in the service truck, and tags on all appropriate tools. These are all very interesting projects that have come across our desks recently. It is amazing how many business processes can benefit from the use of appropriate mobile technology in the field. 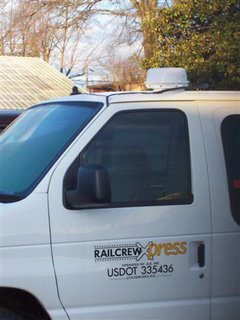 The new rugged system enables RailCrewXpress to record the location and transportation activity of the company's vehicle fleet in real-time. RailCrewXpress handles the majority of the U.S. Class 1 railway crew transportation needs, including crew pick ups, transport to trains, shuttling crew to hotels for overnight stays and in-yard crew transport. With its new mobile computing solution, RailCrewXpress has complete visibility into the cargo and location of its fleet at all times. This was a fun project that my team delivered. It involved a combination of GPRS and Satellite uplink technologies and our PointSync software solution on Psion Teklogix handheld computers mounted to the dashboard of the vehicles. When a vehicle in the fleet could not communicate using GPRS(mobile phone communication) then it would roll over to a satellite uplink. When using the satellite uplink, a different kind of synchronization is initiated that sends a smaller data set. Lot's of fun and pushing the envelope. My engineering team has put over 12 man years into PointSync 3.0, and they are both thrilled and relieved to have it finished. I think we should give them the afternoon off before we start on version 4.0. In all seriousness, our engineers deserve a big congratulations! MobileDataforce's successes are the result of their amazing skills. I am going to advertise a bit. PointSync is the culmination of all that we have learned about mobile software development tools since 2000. We wanted a comprehensive rapid application development environment that gives both novices and coders the ability to develop powerful end-to-end turnkey mobile solutions and PointSync accomplishes that. 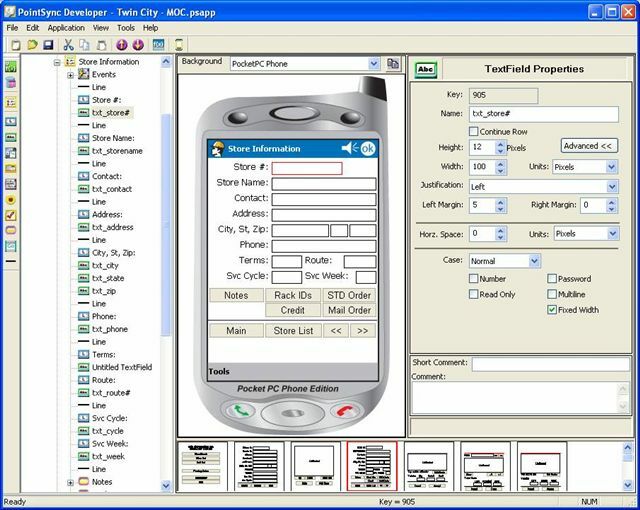 You can download the PointSync Developer, and sample PointSync applications to view on your handheld computer. Let me know your thoughts! The latest Wireless Enterprise Strategies service report from Strategy Analytics, "Profiling the PDA User: Strategies for Generating Network Traffic," affirms that business PDA users represent a prime segment which mobile operators and OEMs should actively identify and target for wireless solution sales. Device set-up, email synchronization and content creation must be dramatically reengineered.Cliff Raskind, Director of the Wireless Enterprise Strategies service commented, "When mobile operators survey their base of business customers, PDA users potentially represent a `dream segment' of users that is tailor-made for upselling many wireless data solutions enabled by next generation networks. While over half of the PDA users remain unconnected beyond simple text messaging, operators, device OEMs and solutions providers have failed to bridge a number of critical performance deficits relating to set-up and ease of use." David Kerr, Vice President of the Global Wireless Practice, noted, "PDA users spend more on mobility, experience much greater frustration when disconnected. They report strong interest in a basket of value added services. So far, however, a combination of device-centric and network-resident barriers have conspired to suppress attachment rates beyond the initial corner office inbox junkies. While improved data economics coupled with expanding device portfolios from Microsoft Mobile partners, Symbian camp evangelists and aspiring Asian vendors all augur well for the future, no dominant paradigm has yet emerged to transition these PDA users into true converged device solutions customers." This report provides a snapshot of the potentially lucrative PDA segment, revealing why they should be in the crosshairs of all mobile operators and device OEMs wishing to succeed in the business market.Other key findings from the report include: · At 105 Euros per month, PDA users spend 53 percent more than non-PDA users on mobile services; · PDA users average 34 percent more minutes of use than non-PDA users; · PDA users are better educated and more likely to buy premium products; · PDA users require more frequent access to email, CRM and other network-based applications. In addition to these field tests, often samples need to be documented and sent to a lab for analysis. This involves a "chain of custody". A chain of custody is when a sample is collected by a field technician, labeled and sent to a lab. The lab needs to document their receipt of the sample, analyze it, and report the results back to the engineering firm which passes this information back to their client. This process involves a chain of participants that all need to document their relationship to the test sample and test results from beginning to end. This brief explanation of a simple process, identifies the necessity for documentation. Since the process starts in the field, it is appropriate to begin thinking about how data collection in the field could be automated. This is where handheld PDAs come in. This information can all be documented on the PDA and wirelessly synchronized to the office database from the field. This saves both the engineer and the administration staff the work of re-typing the data again in the office. The request they brought to my sales team was, "Can MobileDataforce help us develop a standardized mobility framework that can integrate 7 different enterprise applications with 1 mobile enterprise framework?" They wanted to purchase 1 solution that could provide all their requirements, which would save them a great deal of time, money and headaches. That is exactly what my engineering team has been developing since 2000. The result is the new PointSync 3.0. I had the privilege of meeting with a state agency yesterday to discuss field data collection and inspections. This team of government employed IT professionals was tasked with automating many different kinds of inspections. I was amazed at the large number of inspections one team must manage. Today it is nearly all done on paper. The more we discussed the various projects and inspection responsibilities, the greater the ROI was for automating them. The list was enormous and I was impressed with how mobilizing these inspections could save this government agency a considerable amount of money. I've got some work to do! FM professionals often are responsible for the operations of large buildings, campuses, warehouses, and remote properties. Their work consists of gathering all kinds of data from remote areas and entering this data into a central database where it can be managed by any number of FM software applications. The challenge is not so much managing the data once it is in their FM software application, it is collecting the data and getting in entered into the FM software. This is where MobileDataforce comes in. Our software solutions for PDAs and handheld computers enable you to quickly create electronic forms and mobile applications that can be used in the field to collect data and then synchronize it directly into the FM software application. Our integration technology makes it a relatively simple process to integrate with most FM software applications. Remote data collection is a big need, but also the ability to look up information on a building, maintenance project, business process or piece of equipment while you are inspecting the facilities. This requires your handheld PDA to have a RDBMS (relational database management system) on your PDA. Our PointSync solution enables you to replicate your FM application database on your handheld, so you can query information, and update information in the field. Any changes that you make in the field, will be updated to your FM application upon synchronization. Replace paper forms that you use in the field, with electronic forms on your PDA. These can be automatically synchronized with your back-office database applications. Load work order/service orders onto your PDA so you can fill them out and synchronize remotely. Develop an inventory update application so you can check inventory levels and update them from the field. If you are an inspector, or dabble in filling out inspection forms, create electronic versions that automatically load to your database or spreadsheet. Add a bar code scanner to your PDA so you can scan product barcodes and see inventory levels. Add GPS to your PDA so you can quickly find your next job site or customer location. Are you filling out time sheets in the field? If you are a supervisor, you can enter the timesheets of your entire crew and synchronize this information to your office remotely. Do you need to compute a lot of numbers in the field? Do the results of these numbers change what you should be doing in the field? Create a mobile application that can compute your input data and direct your actions based upon results. We work with a lot of inspection processes where the result of the inspect impacts the next step in the business process. Print forms while in the field. Once your electronic form or mobile database application in your PDA has data in it, you can print it to a mobile printer. You can look up historic information and print this for your customers as well. Quality Assurance forms - we have a lot of large companies that send out Quality Assurance auditors to inspect their facilities and processes. You can easily replace these paper processes with mobile applications on your PDA. The value? Quick input of field data so you can immediate analyze the data and implement Q&A improvements. This list identifies a few of the most common uses for PDAs in the field. All of these applications add value to your PDAs and handheld computers. MobileDataforce, http://www.mobiledataforce.com provides software solutions for quickly and affordably developing and implementing these kinds of solutions. Now that you have decided to mobilize one or more business processes, how do you choose a system integrator or consultant that can implement it? There are a few basic details that all consultants who develop and implement mobile solutions should ask you. If they don't ask you these questions, you may want to look for a more experience implementation team. What handheld hardware will you be using(make and model)? What add-on accessories will you be using (GPS, RFID, Digital Imager, Barcode, etc)? Where and how will the user be synchronizing their handheld(at home, office, shop, WiFi, GPRS, cradle, bluetooth, Satellite)? 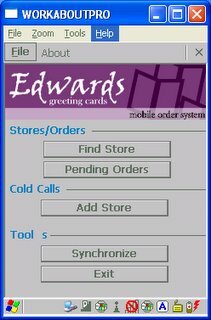 What operating system does your handheld computer have (Win CE.Net, Pocket PC, Palm)? Do the users have working conditions that will impact our solution design (users wear gloves and need big touch screen buttons)? What business process will be mobilized (work order, invoice, time sheet, project status, etc.)? What database do we need to connect to? How do we access it? Can you provide a data model? Do you need mobile printing? Do you need formatted reports? Will they be printed in the field, or in the office? Do you need internet access to this data? If so, who will design the website? Are you going to conduct a "proof-of-concept" first? If so, how many users? What is included in the POC. How do we measure success? Concerning roll-outs - how are we going to roll out this solution to your billion mobile users? How many at a time? How are you going to train the users? When are you going to have the handheld computers delivered? Who will install the software and document how to use them in the field? These are a few of the questions that an experienced team of consultants and systems integrators will ask you before they provide you with a quote. If a consultant does not ask these questions upfront, it does not mean they are bad, just inexperienced and will likely not meet their timelines and cost projections. Paper Forms or Electronic Forms on PDAs? Many companies that contact my sales teams are seeking to replace their paper and clipboard processes with electronic forms on PDAs. Let's take a few minutes to understand why this is most often a good idea, but not always. What is the downside to using a paper form with a clipboard? Paper forms are often submitted with missing information. This lack of completeness wastes considerable time in the office as staff try to contact the original author and gather the missing data. Paper forms can often be left on the clipboard for days or weeks, so there is a delay in getting the information transferred from the paper form into a computer software application for processing. Handwriting on the paper forms is often hard to interpret. This allows for bad data entry into the computer system. Bad data in - bad data out. Paper forms can not validate the information entered on them. So invalid information can be written on the paper forms. Paper forms are easily misplaced, lost or damaged by environmental factors and irresponsibility. Paper forms can not effectively provide you with a list of all possible correct answers. Electronic forms can provide you with "pick lists" or "drop down" menus that limit your answers to only valid ones. Paper forms do not provide you with the ability to query all "products" in a catalog. 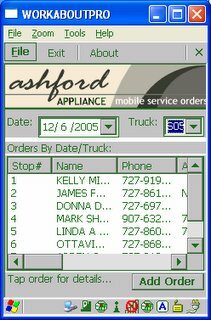 Electronic forms that are tied to a database on your handheld PDA, can enable you to "look-up" lists and databases with product listings and product attributes that will automatically fill in the electronic form. Paper forms do not compute. Electronic forms can compute math, invoice totals, elasped time on a projects, milage, square feet, and much more. Paper forms can not link to many other applications that can provide GPS coordinates, RFID reading, bar code scanning, digital images, CAD drawings, etc. The above list identifies some of the deficiencies of a paper form, however, there are times when either a paper form or a full sized laptop is simply more efficient. I find that when there are a great deal of notes to be taken, it is not efficient to attempt this on the limited screens that PDAs provide. If you have 3 pages of observations and notes to be entered, you need to either handwrite on paper, or use a full sized keyboard connected to a laptop or desktop. Another case is when you have large maps or CAD drawings to view. A PDA screen can be used for specific views, but PDAs are not practical for viewing large areas. In this case either a laptop, Tablet PC or paper version is more efficient and saves your eyes. In segments 1-3 we discussed the various parts of a mobility project, and the different options within these parts. Now let's bring all these together and discuss how they impact the price of a mobility project and our strategy. Someone needs to develop the "mobile client" software that synchronizes with your Work Order Management software in the office. Is this going to be your cousin Bob, or a professional IT developer or consultant? If you are going to use a professional, get a quote on the project costs. Are you going to develop your own mobile software from scratch, or purchase a "software development kit" for mobile solutions from a company like MobileDataforce, http://www.mobiledataforce.com? Get a quote from the software vendor. Are you going to buy a $300 consumer grade PDA that can be easily broken when dropped, or are you going to spend $1,500 on a water resistant and dust resistant handheld that can be dropped to concrete from 6 feet. Search on ruggedized handhelds or call MobileDataforce for referrals. Do you want to call your field service technicians on their mobile phones and read them their next work order, or do you want to have it synchronized out to their handheld device in the field? Contact your wireless service provider for data connection quotes using PDAs or handheld computers with data cards. Once you have made up your mind about these various issues and received quotes, it is time to set project schedules, implementation and test plans. Now we are going to explore some of the options for dispatching work orders to your teams in the field. Handheld computers can now be PDA phones. You can buy a Pocket PC Phone from just about any mobile wireless carrier now days. Palm is even coming out with a Treo 700 Pocket PC Phone this Quarter. The challenge with these devices are their lack of durability when Fumble Finger Fred is using them. Ruggedized handheld computers can also come with wireless data cards built-in. These allow you to send and receive data using the mobile wirless carriers networks, but often do not include "voice" communications. This capabilitiy enables your field work crews to both send and receive work order data at the push of a button on their "mobile client" software. So the office can write up "service orders" and when the field crew pushes a synchronization button on their handheld, any new service orders will be dispatched, and completed service orders would be uploaded to the office. A number of handheld computer manufacturers are also adding VoIP to their handhelds. VoIP is "voice over IP or internet protocals". What does this mean? It means you can talk to your office through the microphone in your handheld computer using the internet connection, rather than the phone connection. The vision here is the following - a junior service technician can call the office asking for advice on a repair job. The supervisor asks junior for a digital photo of the object under repair. Junior holds up the handheld computer and snaps a photo. The photo is uploaded through the data connection to the office. The supervior reviews the photo and talks him through the repair over the VoIP connection. Mission accomplished. OK, so you want to know how much it will cost to get your 10 field service technicians set-up with handheld computers so they can be dispatched work/service orders in the field. Let's explore the issues? What are the major pieces to this mobility solution/project? The first task is to find a "mobile client" software package that will synchronize with your work order management application. The problem is your cousin Bob developed your work order management system 4 years ago for a high school project and he is now back in prison. What next? You may want to find a company like MobileDataforce, http://www.mobiledataforce.com that provides software that you can use to rapidly develop and configure a mobile client that can synchronize with your office software. If you have enough in your budget, it is usually a faster and easier process to involve my professional services team, or to get one of your local talented IT consultant, assuming they are out on probation, to do this for you. The first time is not always your best. Consultants and integrators get better the 2nd, 3rd and 4th time they have implemented the same mobile solutions. The problem is- nearly every mobility project has unique and different requires. How can a consultant or an integrator profitably and successfully implement these mobility projects? The answer - find what is common about all of these projects and productize a solution that can be flexible and powerful enough to be used over and over again to implement mobility projects. All of us involved in consulting know that reusing previously made code, and leveraging your expereince is how you gain the efficiencies that make your projects profitable. My Engineering team has been studying mobility projects since 2000, and productizing the results of their studies. The result is our PointSync and Intercue Mobility Suite solutions. Both of these platforms allow you to consistently produce high quality solutions on standardized mobility platforms. Once your team is familiar with using these "rapid application development solutions for mobile environments" (RADs-ME), they can rapidly develop, edit and customize mobile solutions for new customers. These are just a few of the not so obvious benefits of mobilizing. Please email me any additions that you want me to add to this list. Over the past decade companies have invested heavily into ERPs and other enterprise software applications only to realize that a sizable portion of their employees are mobile and do not have access to these expensive investments. Managers are now asking their IT departments for ways to "mobilize" these existing enterprise software applications. Let's spend a few minutes discussing what it means to "mobilize" a business solution. Mobile application development at a high level involves providing the field user with either a connected, or a disconnected mobile application on a handheld computer or laptop. Connected applications are dependent on a "live" connection using WiFi or mobile phone networks to access the enterprise software application. Disconnected applications have the ability to continue functioning whether there is a "live" connection or not. Most experts in mobility today recommend developing applications that can be connected or disconnected so as not to interrupt the productivity of a mobile workforce. A disconnected mobile application needs to be able to store data on the handheld computer (i.e. in a mobile database or XML file), and then be able to synchronize all the changed data when a connection to the enterprise database application is again available. This allows the mobile field force to continue adding, editing, querying and printing data in a disconnected mode while working remotely in the field. I realize I have over simplified, but at the very highest level, these are the components of a mobilized business solution. So in order to "mobilize" your existing in-house database applications, you either need some very smart developers and a lot of development time, or you find a software company like MobileDataforce that has already developed these tools. -a mobile software solution needs mobile middleware that enables synchronization between the mobile device database and the enterprise database. -a mobile software solution needs to be flexible enough to handle many different kinds of handheld computers and add-on accessories. The features described above are needed by every developer of mobile applications. They are required, but are not cost effective to develop from scratch each time. My team of engineers have spent over 12 man years productizing the features and functions listed above so that you don't have to. Often I hear comments from customers that 80% of their project requirements are already completed, productized and proven in PointSync. You may have a "work order" application that you want available on your field service team's handhelds. In this single mobile application you may want to include data from several different internal database applications. This is "convergence" at the software level. Mobile solutions can be as simple, or as powerful as you want them to be. Regularly companies that need mobile software solutions for their field force are confronted by the choice of whether they should buy a mobile solution or build their own custom solution. This is a fair question, and I am sure there are times when your requirements may be so specialized that custom building is the only way, but this is rare. In most cases your needs are very similar to other companies, and the ability to reuse solution templates and proven frameworks is the better choice. MobileDataforce invested over 12 man years into the development of PointSync. Our goal, which we have now achieved, was to provide a rapid application development solution for mobile environments. We invested in the grunt work so you would not have to. Most of our customers find that their solution is over 80% completed before they even start. They can configure a database connection, instead of coding it. They can configure their mobile application interface, rather than code it. They can configure synchronizations, rather than code it. They can use one of the 130 pre-built functions from our library, rather than code it. One of the biggest advantages is we have been debugging, documenting and improving PointSync through 3 versions. This is a time consuming and often tedious process, but it reaps rewards for our customers. I would not wish this process on anyone. Using PointSync, you can focus on perfecting your mobile business processes rather than on perfecting your code. The value and ROI from your mobile application comes from the business efficiencies it brings to your field force. The faster you can deliver it, and the smoother the implementation, the happier your field force and management will be. Although building it yourself may be necessary in rare cases, most often if you can configure a proven application to enable you to rapidly implement a mobile solution, you, your CFO and your field force will be much happier. Today we are going to discuss two different kinds of mobile software. An electronic forms based application, and full functional mobile database centric applications. You can start simple and cheap by replacing all paper forms and clipboards with electronic forms on handheld computers. These applications usually don't contain databases, just simple data files that you can sync to your backoffice database. MobileDataforce's Intercue Mobility Suite http://www.mobiledataforce.com/mobility_suite/mobilitysuite.asp achieves this aim admirably. You are able to quickly achieve a positive ROI by avoiding the need to re-type data from paper forms to computer systems in the office. The data goes straight from the handheld computer to the enterprise database thus avoiding re-typing errors and misinterpretations. You can also synchronize via a wireless or mobile phone connection and avoid the need to hand deliver the forms. 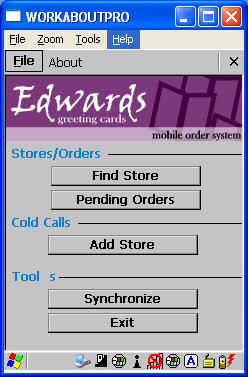 If instead, you not only want to fill out an electronic form on a handheld computer, but query information from your product catalog, or customer history, or latest inventory levels, then you would want a mobile software application that was developed with a relational database management system (RDMS) to store information for look-ups. MobileDataforce's PointSync http://www.mobiledataforce.com/pointsync/index.asp accomplishes this goal. With PointSync you are able to rapidly develop a mobile version of your enterprise software application that synchronizes data from the field. In summary, if you want a mobile interface/mobile client for an existing database application in the backoffice, then you will likely want to use PointSync. If you simply want to replace paper, then MobileDataforce's Intercue Mobility Suite is a great place to start. In the past PDAs were used for simple time management, contact management and email. Now days you can purchase ruggedized (water resistant, dust resistant, drop to cement resistant) handheld computers that include VoIP, mobile phone, barcode, digital camera, RFID and GPS all on the same device. Add to that full functional database centric software applications that can synchronize with your office software applications, and gigabytes of memory on your device. PDAs are no longer toys. Since nearly any of your internal software applications can be "mobilized" and made available in a disconnected mode (not connected by a network, but able to be synchronized when connected to a network at a later time) you have a lot of power at your disposal in the field. The real challenge is how to systematically mobilize your software applications without your ambitions overwhelming your field workers and your IT departments. Where Do You Get an ROI from Mobile Solutions? ROI s (return on investment) is the term used to define the value of a project relative to the cost. If the project costs are $25,000, how will you justify this cost to your senior management? Senior management wants to know why they should spend their hard earned money on your mobile application solution and handheld computers. The following list contains some of the most common justifications for mobile software projects. Save the office staff's data entry time. Enter clean, valid data in the field using your handheld computer and have it automatically synchronize with your office business software application. Dispatch service or work order information directly to your field worker's handheld computer in real time. Improves work efficiency and customer care. You can use bar code scanning on your handheld computer to scan equipment, inventory, buildings, products, etc. Scan a bar code and have all the relevant information on your asset immediately available for your review on the screen of your handheld computer. Immediate invoicing, complete work in the field and immediately print the invoice and hand it to the customer for collections. Improves cash flow and reduces collection issues. The bottom line is that paper based systems are inherently slow and error prone. Many more hands must touch a paper form, and each touch can introduce delays and errors. Creating mobile software applications that can validate the data, ensure accurate input and immediate synchronization to your office software applications creates a much faster, accurate and reliable system. We have all heard the phrase, "information is power." By providing more information to your field workers, you are enabling them to complete their work faster and access required information without the need to involve the office staff in these routine data look-ups. Some of the most surprising efficiencies that are not always recognized upfront, are the ability to ensure all the data is completed and valid in the field. Many paper forms are turned in that are only partially filled out. This requires the office staff to contact the field worker for additional information. This adds costs to both the office staff and the field worker. 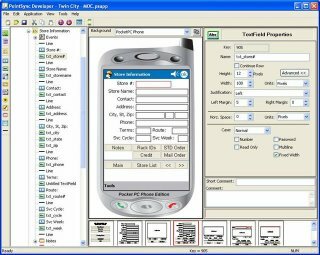 Using mobile software applications in the field, you can require that all data is filled out accurately and completely. So how much time is currently wasted chasing down incomplete paper forms? In the real world - a field worker may use a variety of tools to complete their job. A smartphone to call the office and receive emails, a fax machine, wireless printer and scanner, a laptop computer on the seat of the truck to look up customer information, etc. A complete survey of the business processes that the field user engages in can often demonstrate that nearly all of these tools can be aggregated efficiently into one smartphone application. It is important to recognize the impact on business processes - caused by extending your internal software applications out to your field workers. It is far different than just adding another desktop computer to an empty cubicle. With handheld computers, the user must think about battery life, environmental issues such as water, sand, temperatures, etc, and how they are going to connect to the enterprise software application. One must stop and think about the traditional methods of using paper forms, clipboards, etc, and how a handheld computer will change these processes. One of the first questions to ask is, "what will change?" If a field worker is accustomed to paper forms attached to a clipboard, how will they need to change their habits and routines to take advantage of a handheld computer. It may be that the real advantage of using a wireless handheld computer is the value of sharing information real time. So again, how will having real time updates of information in the field change the business process? Can you open and close work orders, check available inventory, schedule repairs, review customer files, check the shipping status of parts, find directions to your next job site, invoice the customer while still at the job site? If you do want to provide the customer with a paper copy of the completed work order or an invoice, what kind of printer do you need? Printers can sit on the seat of your pick-up truck, mounted to the dashboard of your truck, or attached to your belt for complete mobility. From the hardware perspective, "Where do you keep the handheld computers (at the field user's home, in a locker, at the job site? What is the process for replacing one that breaks? Who keeps them charged? What security is required? How many workers use the same handheld computer?" All of these questions are asked by my PSO (professional services organization) team when they are scoping out a project. It is important to "walk in the shoes" of your field users. Make sure you walk with them and see how the business process is actually done in the field. The success or failure of many mobile application projects are dependent on the field users' acceptance of the solution. Often a project's designed business process changes considerably once you have "walked through the real world" process in the field. Most companies that contact us about buying mobilitiy software, have not yet selected their handheld PDAs. This is not a problem if the requirements for the mobile application are simple data collection, but when the mobile application requires the use of specialized hardware (i.e. bar code scanning, GPS, imagery, digital photos, RFID) it is important to understand your needs before implementing a software solution. Why? There are hundreds of different handheld computers with hundreds of different add-on features. These add-on features and hardware components have "software" drivers. These "drivers" enable a software application to "communicate" with the hardware component. These drivers are most often publically available, but they still require someone to add them to your mobile software application. So when my PSO (consulting team) reviews a project's requirements, they will look to see if there are any new "software drivers" that need to be added as part of the deliverables. So how do you know what kind of hardware to purchase? This really depends on the environment where the work will be conducted. Do you need water resistant, or water proof? Do you need a numeric keypad, or full alphanumeric, or can you get by with simple push buttons on the screen? Do you need GPS, bar code or RFID integration? If so, do you need these all of the time, or only on special occasions? Will they be dropped on concrete daily, weekly or monthly? Are you working in mud, dust and sand? Generally the more ruggedized you need the higher the price you will pay. How will you synchronize the handheld computer? Will you use a simple cradle mount, or do you want to synchronize from the field? Do you have access to a WiFi hotspot, or do you need a GPRS data card? Again, these decisions effect both the cost of the hardware and the hardware components you need. Another question is what kind of battery life do you need? Do you need an 8 hour charge, or a 16? Do you want to purchase spare batteries, do you want to be able to charge the battery via a car charger or simply purchase an extra heavy duty batttery upfront? It is worth the extra effort to effectively survey the working environment of your team before you purchase the hardware. This will help you ensure that the handheld computers that you purchase will match your working environment, and that you have purchased the hardware configuration that will provide the optimal return on your investment. Greetings Readers - I am the CEO of a software company called MobileDataforce, http://www.mobiledataforce.com. We develop software for people wanting to use their PDAs for work. Not the traditional white collar email applications, but industrial grade data collection, bar coding, RFID, GPS, etc. PDAs are finding a new life in the market as real tools for people working in the field. They don't want games and chat, they want an extension of their office applications on pocket sized computers.